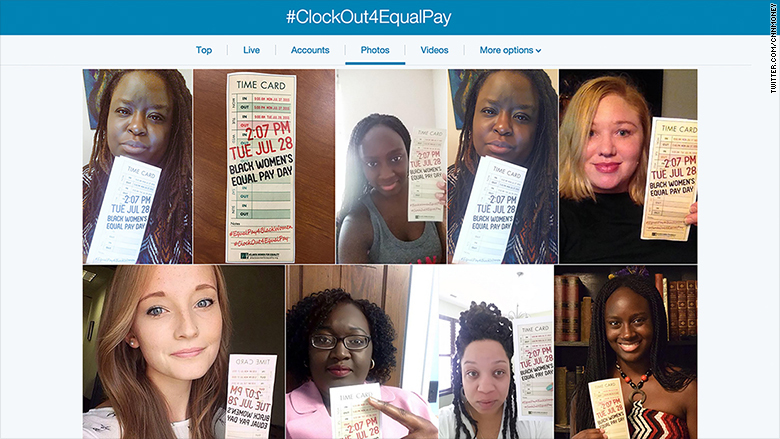 Equal pay advocates posted selfies with fake time cards, ready to "clock out." An Atlanta-based advocacy group has dubbed Tuesday "Black Women's Equal Pay Day" and the idea has quickly gained traction on Twitter (TWTR) and Facebook (FB). Atlanta Women for Equality wanted workers across the nation to virtually "clock out" at 2:07 p.m. If a black woman stopped working at 2:07 p.m., the group said, it would make up for her wage gap with white men. That's based on U.S. Census Bureau data that shows black women make about 64 cents to a white man's dollar. The group says if a white man stopped working at the end of 2014, a black woman's earnings would take until this date to catch up. Participants weren't asked to leave work, but instead to take to social media with selfies holding fake time cards. Lisa Anderson, the executive director at the Atlanta Women for Equality, said her organization has worked to address all gender wage-gap issues -- but wanted to make the public aware that the disparity is worse for minorities. "The wage gap is far greater for black women than it is for white women," Anderson told CNNMoney. "That of course has a very big impact on the lives of not only black women, but black families." She said that recent publicity surrounding police brutality cases against blacks has brought the difference in everyday life between black Americans and white Americans more into the mainstream's consciousness. She added that fixing the wage gap isn't easy. Litigation is often long and difficult, and workers worried about steady income don't want to take on their employers in court. Workers should bring equal pay issues to unions, she said, and at least seek out legal advice. And because women often don't realize they're being underpaid, she wants coworkers to start talking about their compensation. "A lot of companies have policies saying (employees) aren't supposed to discuss their wages, but that's not legal," Anderson said. Politicians, advocacy groups and other users adopted the hashtags "#ClockOut4EqualPay" and "#BlackWomenEqualPay." "Black women face a stark wage gap and are more likely to work in lower paid occupations," the U.S. Labor Department tweeted. Labor department secretary Tom Perez also wrote, "African American women have to work for nearly 19 months to equal what white men make in a year. This is inexcusable." Chirlane McCray, activist and wife of New York City Mayor Bill DeBlasio, wrote, "It's 2:07 pm; imagine if you stopped getting paid for the rest of the day." Federal data shows white women earn about 78 cents to every dollar a white man earns. The divide between a black woman and a white man's earnings, however, is about 64 cents to the dollar.